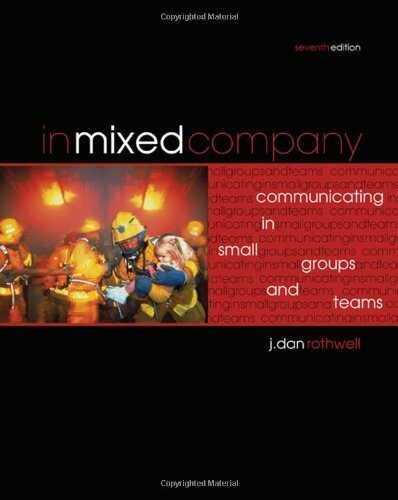 IN MIXED COMPANY: COMMUNICATING IN SMALL GROUPS AND TEAMS was written for the small group communication course offered at two- and four-year colleges and universities. The small group communication course typically covers the underlying principles and skills necessary for group participation and communication. Topics covered include theory, group development, climate, roles, leadership, discussion, decision making, teamwork, conflict management, group presentations, and outcomes assessment. The goal of small group communication is to teach students to become more effective group members and leaders by giving them research-based tools and practical applications to participate successfully in teams. The course tends to be taught by the same instructors every year or term, and the book is often chosen by that individual rather than by committee. The format of the course won't vary tremendously from school to school, so tables of contents in the small group communication books aren't radically different from one another. Some instructors want to use more case studies and experiential exercises for beginning students or offer more current research theory for upper-division students of communication. J. Dan Rothwell is chair of the Communication Studies Department at Cabrillo College and the author of four additional books: IN THE COMPANY OF OTHERS: AN INTRODUCTION TO COMMUNICATION, TELLING IT LIKE IT ISN'T: LANGUAGE MISUSE AND MALPRACTICE, INTERPERSONAL COMMUNICATION: INFLUENCES AND ALTERNATIVES with James Costigan, and PRACTICALLY SPEAKING. During his extensive teaching career, Dr. Rothwell has received almost two dozen teaching awards, including the 2010 Ernest L. Boyer International Award for Excellence in Teaching, Learning, and Technology conferred by the Center for the Advancement of Teaching and Learning, Florida State College, and the National Council of Instructional Administrators; the 2010 Cabrillo College "Innovative Teacher of the Year" award; the 2011 National Communication Association "Community College Educator of the Year" award; a 2012 official resolution by the California State Senate acknowledging his excellence in teaching; and the 2014 "Master Teacher" award from the Western States Communication Association. He has a B.A. in American History from the University of Portland (Oregon) as well as an M.A. in Rhetoric and Public Address and a Ph.D. in Communication Theory and Social Influence, both from the University of Oregon. "Students will benefit from using this book because it provides them with the theoretical basis for understanding groups, as well as the practical skills for navigating the group process." 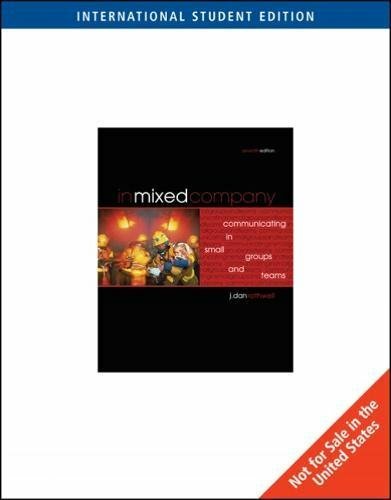 "In Mixed Company is a well-organized, practical and useful textbook for an introductory course in small group communication. It will provide introductory students with the information necessary to practice small group communication skills." "I think this is a great book. I would recommend it to my colleagues as containing most of the concepts we cover in our courses."